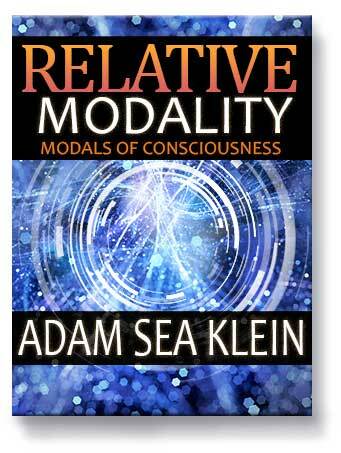 Relative Modality is a unique modern perspective of the evolution of consciousness, and understanding of the modalities of human behavior. The intent of this information is to bring together many concepts, diagrams, and simple inclusions that help a person unify a concept of human possibility. This material was established with the concept of "elaboration of consciousness" in mind. History has many names for this type of material, and has sprouted many fields of study for this topic, and also many names for related experience. Some names would be Illumination, Grace, Self-Realization, Gnosis, and more recently called Cosmic Consciousness. Information like this has come in many forms historically, and has been studied by many people - however Relative Modality is a totally new concept, and each diagram is new to this collection. For humankind to gain greater ability to evolve consciousness is of profound importance. This material was written for one purpose: to improve the common well being across humanity. It took substantial time to assemble the work here for Relative Modality, and for CosmicTome.com as well - thousands of hours of learning, doing, reflecting, and creating this material which spanned over many years. It also took much deliberation to figure out how to best handle exposure for this material. With great consideration, it was determined that the best way forward is to provide open entry to all of this material; free to the public. The material for both books / websites (RelativeModality.com and Cosmictome.com) were created by one person, and the websites are hosted by that same person. These sites are created with no expense spared, and due to the image-heavy nature of both websites, there are hosting and traffic costs to consider. If someone wishes to donate any amount to help support hosting, it would be gratefully received. Making this material free is to allow people of every age and income bracket to see these concepts, and understand how these pathways can help their lives. 1) To better understand oneself and navigate one's own perspective into more coherent, useful, lasting, or enjoyable states of mind - conditions that better match values a person can fully believe in. 2) To create a congenial relationship between one's mind and a better image of what the universe is truly about. 3) To create internal leverage to preserve mental and emotional space and identity among a world that often leads to behavioral crafting by social environments that sometimes conflict with personal well being and health. - Reaching for ideal components, positive and high mentalities. - Dealing with the fact that we are still animals in a 3-Dimensional world. The primary aim of many thinkers and mystics is the need to reach a universal truth - this can lead to idealism, which is a great thing, however, the natural world is not idealistic, and the human social world is largely not based on idealism. So, those who seek higher consciousness face a dilemma - they are almost always interacting with conditions that destabilize the very condition they actively seek to stabilize. This leads to a very time consuming active daily practice to remain very fine tuned in higher states of mind. Great acts of kindness, and helping others. Taking part in emotionally stabilizing, projecting, uplifting activities of the mind such as meditation, prayer. Contemplation based 'reaching' - which may include extreme acts of mental searches utilizing all the knowledge one knows, experiences of the past, and whatever understanding can be sifted along the way. Extreme efforts like this are depicted in such practices as Gnosis, Jnana Yoga - the yoga of thought - Jewish mysticism, and many other fields. Experiential based searches - there is a rather large range of practices that exert specific efforts to alter the course of one's behavior and lifestyle through specific acts that change behavior along the way. Such examples can be found Shaolin monks who practice extreme self-discipline, the physical Yoga's, and even long efforts of self-reflection such as those who hike the 2,000 mile Appalachian Trail with the goal of self-reflection and change at hand. Most religions and sciences of the mind share a common characteristic - having some model of human behavior at the core of the teaching. Some ideologies have a central figure who exhibits traits most believed in. Some systems have conceptual structures, such as the theories established by famed psychologists. Relative Modality is a system of similar nature, however the intent is specific in allowing a person to identify causation patterns in the cycles of human thinking. The potency from the Relative Modality structures can serve to de-rail not only personally harmful patterns of thinking, but also to simultaneously help push oneself out of social patterns that keep the mind submerged in lower states of consciousness. Basically, the model is effective for both internal thought and external social analyzation at the same time. These models are simple and effective, though at first glance they may seem complex, a small amount of time identifying these elements can lead to easy pattern recognition in oneself. The effect is neutralizing in a positive way overall, though it can be uncomfortable at times, as the nature of contemplation sometimes is. - The human mind is excellent at abbreviating rather complex principles (Gestalt principle). - Expression patterns are limited, and have limited 'range' of 'movement'. - Expression patterns hold structural qualities. These structures define emotions which are arranged into behavioral packets. - Cognitive emotional states evolve and change in limited ways - and such states usually have identifiable pre-cursors and also lead to a narrower range of predictable outcomes in the next state of mind. - Human behavior is typically role-based. The human brain has evolved over great lengths of time based on social hierarchies - and regardless of the circumstances, in most social arrangements there is an acute awareness of social hierarchy - though some people are emotionally passive to that hierarchy while others feel it with great sensitivity. This is not easy to note in pure thought-based analysis, but usually emotional keynotes reveal this predicament quite easily. What seekers of higher consciousness wish to experience is usually some kind of peak beyond the veil that hides the secrets of the universe, or to leap into a greater way of existence, or to escape from unwieldy emotional aspect of the world. What is often understood at the core of the seeker's problem is a disconcerting and high expense of energy on subconscious processes, frustrations in communication, unreliable ways to achieve positive emotions, and a sort of redundancy problem that comes from mental and social issues that sprout from re-curing dramas that play out in the world. If a single person were thought of as a source of energy, or like a river, we would be considered to have a finite resource. Life requires the expenditure of that resource, and with each energy consuming aspect to our state of consciousness, the river is forced to fork again and again. What many people come to feel is that the human being feels best, most positive, energetic, and ready to thrive in this world when their river flows as one great moving source of energy. However, social complications and behavioral diversions, and the constant comparing and contrasting that occurs subconsciously in the human existence creates one additional fork in the river after another. And this is the source of the dilemma - people who seek higher states of consciousness typically feel they are split up in so many directions, that it's simply impossible to become one great flowing river again. This problem is made somewhat more complicated due to the unique ways that different minds operate. Not everyone is satisfied with the same principles, emotional states, or goals. Not everyone can achieve unity by the same method. So, as human beings, many are on a constant search for some greater state of mind, or simple basic happiness. Relative Modality cannot hand over happiness, but some of these models can trigger release points and lead to easy reference for future use - with the simple intent of freeing up the river, and dashing out some of the energy consuming river forks. The human being is a great conduit of energy, and that energy runs from brain to body, head to toe. Our emotions create fissures, and like rocks in the river cause the water to divert, and like forks in the river, force water to almost permanent flow in certain directions. This can be good and positive, however we are not in total control of ourselves - our experiences and social interactions can create very poor divestitures of energy, and bad as they may be, these forks in the river can become embedded in us for great lengths of time. And that is the purpose of Relative Modality - to help disassemble some of those near permanent, problematic issues that have become a part of us over time. - No one can assert the prime motive of the universe, however it can be assumed that we are intended to: experience, learn, grow, and establish a relationship with ourselves, the natural world, and other lifeforms. - If we treat our personal problems at face-value, these problems can remain like haunting shadows through our subconcious mind. - Human beings are better at attaining self-control through positive methods of self-empowerment, establishing belief through positive means, and creating change through positive self-empowerment. This means we sometimes must take down a structure in order to rebuild. We must sometimes establish our own focal point on qualities not exhibited in the world, rather created by ourselves. We must sometimes exclude ourselves from what is going on, in order to evolve beyond what is occurring around us. Relative Modality is a simple series of structures that can be used to do these things. The basis of Relative Modality is simple indeed: we are an animal, we are energy that must move forward in expression, our energy is forced to evolve which means how we feel right now will change - that change is often out of our control. Our emotions and mind will move either "as they will" or with our own intervention, we can occasionally redirect the future of our energetic state and expression by derailing the otherwise next state by identifying the pre-cursor. We are animals in a 3-Dimensional world. We are energy first. From our resting state, we will rise, and we must choose: what next?